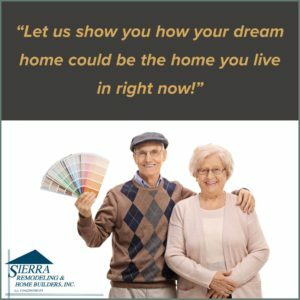 We hired Sierra Remodeling for two major projects — one in 2014 and one in 2015. In 2014 Scott created a design to totally update our kitchen. He listened to every work and designed a functional, beautiful kitchen with incredible storage space. No other contractor was even willing to discuss or listened to our needs. Were it not for Scott and Sierra Remodeling we would never have the luxury we do today!